All prices listed include shipping costs. - Select Nursing Home Fact Sheets, including "Making Care Plans Work"
Outlines requirements for Medi-Cal. Includes discussion of protection of assets, including the home, when a spouse enters a nursing home. Booklets available in English, Spanish and Chinese. 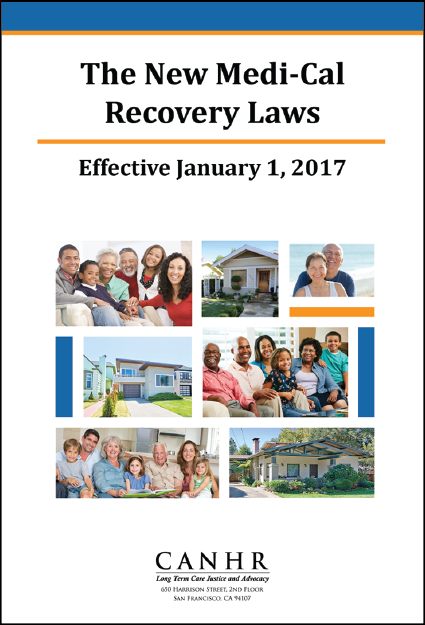 This booklet has been revised to provide guidance on the new Medi-Cal Recovery laws that are effective for those individuals who die on or after January 1, 2017. For individuals who die prior to January 1, 2017, the current recovery rules will apply. This booklet outlines applicable rules for both the current law, and the new law. Learn the most common financial scams targeting seniors and what you can do if you think you've been victimized. "Toxic Medicine: What You Should Know to Fight the Misuse of Psychoactive Drugs in Nursing Homes. " This guide is designed to assist RCFE (Residential Care Facilities for the Elderly) residents in protecting their rights, helping them resolve violations of their rights and, if applicable, receiving compensation for an RCFE’s bad conduct through small claims court. This consumer’s guide provides essential information to make an informed decision regarding whether a Continuing Care Retirement Community (CCRC) is right for you. Includes a personal questionnaire, Points to Consider for CCRC Consumers, to aid you in your decision. Includes guidelines, relevant law and sample forms. Instructional DVD for the establishment and functioning of family councils; includes a booklet with guidelines relevant law and sample forms. Factsheets are available for free from our site.